So I decided to use emu oil to grow my hair back around my left upper temple area. Over fifteen years ago, I had a touch-up and the hair dresser left the relaxer on a little too long. So long that when I got home after wards, my hair having been already curled, set, and styled, I found the lye was still on my scalp. Needless to say, hair no longer resides there. Also, another interesting point is that one site isn’t allowed to release any research information for one experiment until it is published in a scientific journal, (Read more here) which is actually a great thing. The peer-reviewed science journals have other scientists checking research facts for submitted studies and they give the yes or the no for publication. So if they check out the emu oil research and see that the results are flimsy, they won’t publish it. There has been research from Australia regarding its moisturizing abilities. Yet other claims have been set forth such as the oil possessing anti-aging, and anti-wrinkling properties and healing wounds (Begoun, 2004). Additionally, I’ve heard that it may even be able to reverse hair loss. So indulge me for three months and follow me on my own clinical trial to see if there’s anything to these promises. But first let me tell you a little bit about emus. They are large flightless birds which originate from Australia (Begoun, 2004) and their oil originally had been gathered by Aborigines by hanging emu skin on trees and letting the sun liquefy the fat creating the oil (2008). So this is week one. This is week two. I really don't see much of a difference. Actually my hair is straighter yet it also looks like there is less hair there. Yikes! Though, I have to admit, I tend to twirl my hair in that area as well so I probably should stop doing that. Ok, I don't think this is working because the bald patch looks bigger to me. It is week 4 and still there really isn't more hair in this area of my head. I may just have to accept that the effects of the chemical burn aren't going to change. Week 5 looks similar to week 2. I really see no progress. At least I'm not completely bald in that spot...just a little bit!! It's week 6 and there is really no progress. The picture that has the most hair is week one. Oh dear! I'm at the halfway point. So I have six more weeks to test this. Week 7 looks promising. There is definitely more hair than last week. Okay, I see shadows of hair and less cue ball spots. Last week I did a flat twist involving that area of hair and I think that helped a lot. So it is week 9 and I have three weeks left for this mini-experiment. My hair is not as full in that area as last week, but there is still hair. This is so confusing. I thought I would see a pretty consistent type of growth, but this is any thing but consistent. The area is growing slowly and steadily. I feel that a big help has been braiding or twisting that area as to leave it alone after applying the emu oil. This week I had my hair in a cornrow style; I applied the emu oil in and around the cue ball spot yet cornrows and braids prevent you from constantly touching your hair because you will disrupt the style, which is good. Wow! This is a difference. This last week I wore my hair in this natural hair style. I believe leaving this area alone by twisting or braiding it may help with growth. I know there was a period of time in the first couple of weeks that I would twirl my hair and it may have broken off as result. Ok so this is the last week. I summarize my findings below. Thanks for reading and putting up with the insanity!!! My results still do not confirm that emu oil increases natural hair growth because I botched the experiment due to twirling my hair, which broke off already short strands, creating inconsistent results from weeks one to six. While there is noted growth, between week seven and twelve, I also had changed my style to cornrow braids and twists during weeks 11-12 in that area. So, what little hair I did have, I corn rowed over and twisted so my twirling fingers couldn’t get at it. Yet, who knows whether the style itself or the emu oil actually helped grow my hair back. This is what makes the experiment a wash. However, I did learn that protective natural hair styles are helpful and possibly great ways to guard sections of your hair from even yourself. From a sealing moisture point of view, the oil is very light, blends in quickly and definitely does its job. I don’t like a lot of build up in my hair so if you were looking to seal your hair with an oil, because of its lightness, emu oil, would be a contender. 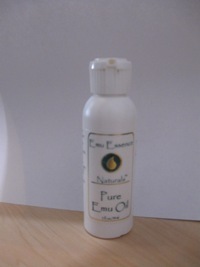 Below is the picture of the 2 oz emu oil I used, named Emu Essence Naturals, Pure Emu Oil. One research study has shown emu oil to be a good moisturizer. Read here about why tightly curled hair needs moisture.